PART I AMBER'S CREATION, BANG DEAD GAMES, AND THE LONE VIOLINIST: 1 The lone violinist in the woodlands at dusk (Ghost, as Hook), 2 The terrace pool at the house on Electra Drive, 3 Here come the Beasts, up the slopes of the canyons, 4 Declaration of war by the Dreary Ones (Inciting Event), 5 "Ain'tTheyFreaky!" by Bang Dead Games, 6 Jaymi conceives his game "The Platinum Raven", 7 Development and basics in the Avenue of the Stars tower, 8 Infrastructure and stress-balls in the Avenue of the Stars tower, 9 Jaymi creates Amber's code, 10 Visuals and laughter in the Sunset Boulevard building, 11 Coding and khaki in the Sunset Boulevard building, 12 Jaymi creates Amber's appearance, 13 Jaymi's games "The Imagination Thief" and "The Host in the Attic", 14 Jaymi incarnates Amber (First Doorway of No Return). PART II "GAL SCORE", EVELYN'S CREATION, AND THE STALKING OF THE DREARY ONES: 15 Amber incarnate in the house on Electra Drive, 16 The Hollywood cafe on Cahuenga Boulevard, 17 The "Gal Score: Babe or Gross?" Newsfeed, 18 Jaymi creates Evelyn's code, 19 The Silver Lake bar on Hyperion Avenue, 20 How very concerning - did you report it?, 21 Herb hacks Evelyn's code, 22 Herb at home in the Westwood Village cottage, 23 Jaymi creates Evelyn's appearance, 24 Amber stalks Ashley through the motel by LAX, 25 Evelyn's appearance comes alive, 26 Kelly smudges Evelyn, 27 Kelly at home in the Factory Place loft, 28 Jaymi creates Evelyn's soundtrack, 29 Ashley at home in the Century Park East apartment, 30 Evelyn's soundtrack comes alive, 31 Amber stalks Dud at work, 32 Jaymi test-drives Evelyn, 33 Kelly tails Amber through the Hollywood Hills, 34 Jaymi incarnates Evelyn, 35 Ashley and Dud attack Evelyn (First Pinch Point). PART III "GUY SCORE" AND "TRIVIA SCORE", SHIGEM'S AND KIM'S CREATIONS, AND THE RIGHTEOUS GUN COCKPIT: 36 The "Guy Score: Hunk or Gross?" Newsfeed, 37 Jaymi creates Shigem's code, 38 Amber with binoculars on Sunset Plaza Drive, 39 Shigem emerges within his code, 40 Herb hacks Shigem's code, 41 The infinity pool at the Blue Jay Way house, 42 Jaymi creates Shigem's appearance, 43 The severed grey tongue-meat swinging round the football, 44 Shigem's appearance comes alive, 45 Kelly smudges Shigem, 46 The "Trivia Score: Wacky or Boring?" Newsfeed, 47 Jaymi creates Kim's code, 48 Herb hacks Kim's code, 49 Evelyn, tiny in the face of the deluge, 50 Jaymi creates Kim's appearance, 51 Kelly smudges Kim, 52 Sun-glare and skinny palms in Westmont, South Central, 53 Jaymi creates Shigem's and Kim's soundtrack, 54 The Righteous Gun Cockpit, from Bang Dead Games, 55 Jaymi test-drives Shigem and Kim, 56 Amber's eyes in the photo of the motel by the vacant lot, 57 Jaymi incarnates Shigem and Kim, 58 Ashley and Dud attack Shigem, 59 Evelyn's eyes in the photo of the motel by the liquor store, 60 Ashley and Dud attack Kim, 61 Kim on the canyon by Hercules Drive, 62 Dud shocked in the motel by the liquor store, 63 Dud shocked in the motel by the vacant lot, 64 Dud's ghastly photo opportunity, 65 Jaymi refines Shigem, 66 Lethal attack, understanding and despair (Midpoint). PART IV "ARTS SCORE", THE PLATINUM RAVEN'S CREATION, AND ELEVATING DOWNTOWN L.A.: 67 The "Arts Score: Simple-Smiley or Complex-Frowny?" Newsfeed, 68 Jaymi creates the Platinum Raven's code, 69 Herb hacks the Platinum Raven's code, 70 Three Beasts sneak into Herb's computer, 71 Jaymi creates the Platinum Raven's appearance, 72 KitKat and Krispy Kreme dramas in Downtown, 73 The Platinum Raven's appearance comes alive, 74 Kelly smudges the Platinum Raven, 75 This Downtown L.A. is a more peculiar one than most, 76 Jaymi creates the Platinum Raven's soundtrack, 77 The street queens of Violet Street, 78 The Platinum Raven's soundtrack comes alive, 79 Hatred across the L.A. River: a cruel and stupid world, 80 Jaymi test-drives the Platinum Raven, 81 Shigem shames Herb, 82 Jaymi incarnates the Platinum Raven, 83 A unicorn's-horn of invention by Herb, 84 The Platinum Raven's mission to Blue Jay Way, 85 Ashley and Dud attack the Platinum Raven (Second Pinch Point). PART V "COSY SCORE", SCORPIO'S CREATION, AND THE BEASTS GO REPURPOSING: 86 The underground server farm beyond LAX, 87 The Platinum Raven in the house on Zeus Drive, 88 The "Cosy Score: Normal-Comfy or Strange-Scary?" Newsfeed, 89 Jaymi creates Scorpio's code, 90 Kim shames Ashley, 91 Scorpio emerges within his code, 92 Feint of a hack into Scorpio's code, 93 Jaymi proposes the repurposing to Herb, 94 Jaymi creates Scorpio's appearance, 95 Scorpio's appearance comes alive, 96 Talking of meat, 97 Kelly smudges Scorpio, 98 Jaymi creates Scorpio's soundtrack, 99 Jaymi test-drives Scorpio, 100 Jaymi instructs the Beasts for the repurposing, 101 Jaymi incarnates Scorpio, 102 Amber's mission in the El Segundo refinery, 103 The Platinum Raven's mission on Avion Drive, LAX, 104 The Beasts converge on Sandpiper Street, 105 The club night in the server farm, 106 Amber heading east on a mission to murder, 107 Victory and disaster (Second Doorway of No Return). PART VI THE JAYMI BEAST'S CREATION, BATTLE AND TRANSCENDENCE: 108 Dud's bad morning, 109 Police romance and the apex predator, 110 Feint of a co-attack on Scorpio, 111 Scorpio as succubus in the house on Jupiter Drive, 112 The weak tan figure and the vast tornado, 113 Jaymi's games "Apricot Eyes" and "Hallucination in Hong Kong", 114 Jaymi creates the Jaymi Beast's code and appearance, 115 Jaymi incarnates the Jaymi Beast, 116 From Mulholland Highway to the Hollywood Sign, 117 Transcendence, vengeance and fierce beauty: the private screening (Climax), 118 Torment on Mount Lee (Climax), 119 One apart (Climax), 120 Bridge to "The Imagination Thief" (Resolution). Rohan Quine is an author of literary fiction with a touch of magical realism and a dusting of horror. He grew up in South London, spent a couple of years in L.A. and then a decade in New York, where he ran around excitably, saying a few well-chosen words in various feature films and TV shows, such as "Zoolander", "Election", "Oz", "Third Watch", "100 Centre Street", "The Last Days of Disco", "The Basketball Diaries", "Spin City" and "Law & Order: Special Victims Unit" (see www.rohanquine.com/those-new-york-nineties/film-tv). He's now living back in East London, as an Imagination Thief. In addition to its paperback format, his novel THE IMAGINATION THIEF is available as an ebook that contains links to film and audio and photographic content in conjunction with the text. See www.rohanquine.com/press-media/the-imagination-thief-reviews-media for some nice reviews in "The Guardian", "Bookmuse", "indieBerlin" and elsewhere. It's about a web of secrets triggered by the stealing and copying of people's imaginations and memories, the magic that can be conjured by images of people, the split between beauty and happiness, and the allure of power. Four novellas - THE PLATINUM RAVEN, THE HOST IN THE ATTIC, APRICOT EYES and HALLUCINATION IN HONG KONG - are published as separate ebooks, and also as a single paperback THE PLATINUM RAVEN AND OTHER NOVELLAS. See www.rohanquine.com/press-media/the-novellas-reviews-media for reviews of these novellas, including by Iris Murdoch, James Purdy, "Lambda Book Report" and "New York Press". Hunting as a pack, all four delve deep into the beauty, darkness and mirth of this predicament called life, where we seem to have been dropped without sufficient consultation ahead of time. 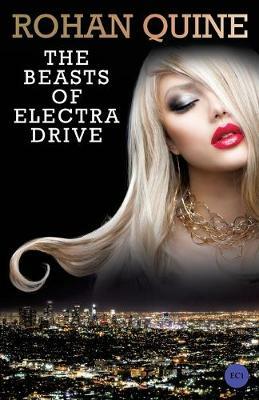 His new novel THE BEASTS OF ELECTRA DRIVE is a prequel to the above five tales, and a great place to start. See www.rohanquine.com/press-media/the-beasts-of-electra-drive-reviews-media for reviews by "Kirkus", "Bookmuse", "Bending the Bookshelf" and others. From Hollywood mansions to South Central motels, havoc and love are wrought across a mythic L.A., through the creations of games designer Jaymi, in a unique explosion of glamour and beauty, horror and enchantment, celebrating the magic of creativity itself. www.rohanquine.com | facebook.com/RohanQuineTheImaginationThief | @RohanQuine | vimeo.com/rohanquine "Rohan Quine is one of the most original voices in the literary world today - and one of the most brilliant." -"Guardian" Books blogger Dan Holloway "The swooping eloquence of this book had me hypnotised. Quine leaps into pools of imagery, delighting in what words can do. The fact that the reader is lured into joining this kaleidoscopic, elemental ballet marks this out as something fresh and unusual. In addition to the language, two other elements make their mark. The seaside ghost town with echoes of the past and the absorbing, varied and rich cast of characters. It's a story with a concept, place and people you'll find hard to leave." -JJ Marsh, "Bookmuse" "Quine is renowned for his rich, inventive and original prose, and he is skilled at blending contemporary and ancient icons and themes." -Debbie Young, "Vine Leaves Literary Journal"